Happy Earth Day everyone! 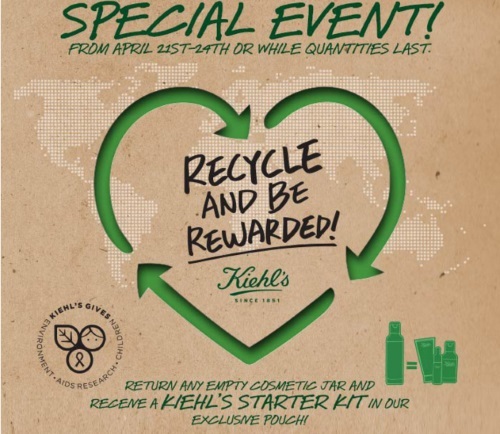 Kiehls is offering their special Earth Day promotion again this year! Get a Free Kiehls Starter Kit in their exclusive pouch when you bring in any empty cosmetics container! This offer is valid April 21-24, 2016 or while quantities last. I suggest calling ahead to see if your store has any remaining, these sell out quickly every year. This offer is valid at any participating Kiehls store, but I have included a link to the Mapleview Mall ad as an example as proof that this is happening. I get this every year as well, it's a great freebie! The empty container can be from any brand, does not have to be Kiehls. They will recycle it for you. Update April 22 - I picked up my Free Earth Day Kiehls Starter Kit, click here to see a pic on my Instagram. Click here to see last year's promotion when I picked up the freebie. Click here to find a Kiehls store near you.